The device invented by Dutchman Boyan Slat to remove plastic from the oceans and which is currently being tested in the Pacific Ocean has run into trouble, its inventor has said in the Volkskrant. 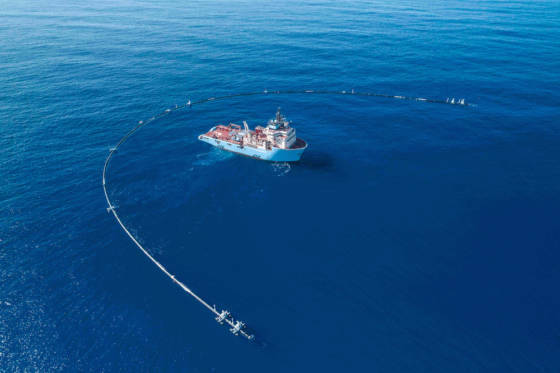 The plastic catcher, a 600 metre floating tube with a skirt attached to sweep up the plastic debris, is not moving fast enough to be able to hold on to the plastic. But Slat said in a Twitter message that the problem is not an insurmountable one and that ‘most aspects of concept have been confirmed. ‘It’s just not moving fast enough yet. This is fixable,’ he said. Just a reminder for media (and critics) who enjoy writing that “The Ocean Cleanup doesn’t work”: most aspects of concept have been confirmed (wind vaning, intercepting plastic, wave following) – it’s just not moving fast enough yet. This is fixable. The device will not be brought back to San Francisco where it started its journey but technicians will be trying to make the device move faster on the spot by adapting its U shape so it will catch more wind or by adding sails. Slat came up with his Ocean Cleanup project in 2012 and spent the next five years developing it, for which he collected over €30m in donations. Two months ago the system was put in place to tackle the huge plastic soup between San Francisco and Hawaii called the Great Pacific Garbage Patch.